If you’ve ever had carrot juice, you know what a treat it can be—bright orange, sweet, and bursting with carrot flavor. But can you make carrot juice with a Vitamix? Traditional juicers remove most of the fiber, whereas blenders leave it in. If you blend a super-juicy fruit like grapes or watermelon, you will get a liquid; but if you just blend carrots, you will get a thick purée—similar in consistency to applesauce—not a juice. You can make a purée drinkable by adding liquid and/or various juicy fruits, which is what I do with my usual smoothies. 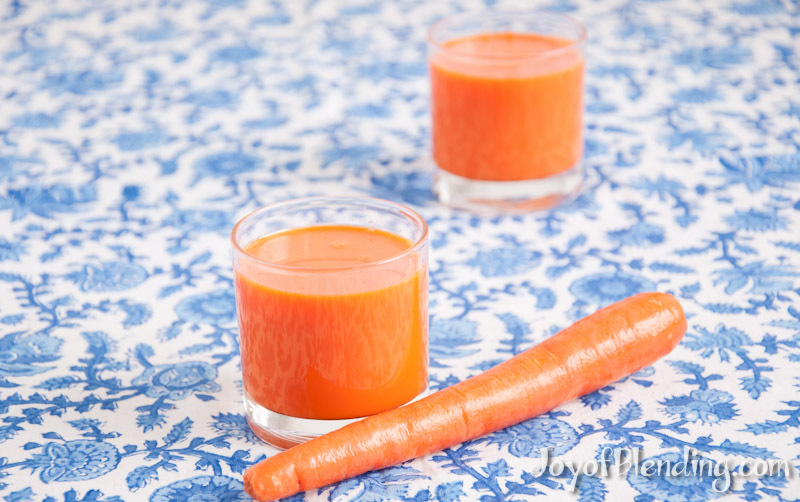 Vitamix and Blendtec both have recipes for a “whole-food” or “total” carrot juice that add water, ice, and lemon juice to carrots (Blendtec also adds a bit of ginger). I’ve tried those recipes and they’re perfectly enjoyable, but they’re just not the same as a pure traditional carrot juice. They end up a bit watery (which is what the addition of lemon tries to compensate for). I decided to try making an undiluted carrot juice using a filtration/“nut-milk” bag, and it worked surprisingly well. I used the Vitamix-brand bag, but there are an abundance of cheaper options on Amazon. I have made this twice so far. The first time I just scrubbed the carrots, but the juice came out a bit bitter, so the second time I peeled them. Peeling made a big difference: sweeter, less bitter, purer flavor. I don’t peel when I toss a carrot into a smoothie, but it’s worthwhile to peel the carrots for a juice like this. I used 1 pound of carrots in a narrow Vitamix container. If you are using the Next Generation wide container I would recommend a bit more, maybe 1.5 lbs. No water needed! 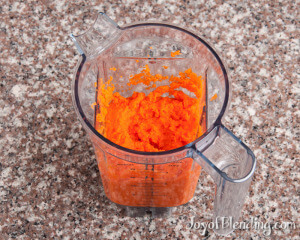 Use the tamper and blend on high until the carrots just start to circulate. (The sound of the machine will lower in pitch as it’s circulating because the blades face more resistance.) You’ll have to tamp aggressively, and focus on pushing the corners down. It took around 45 seconds. 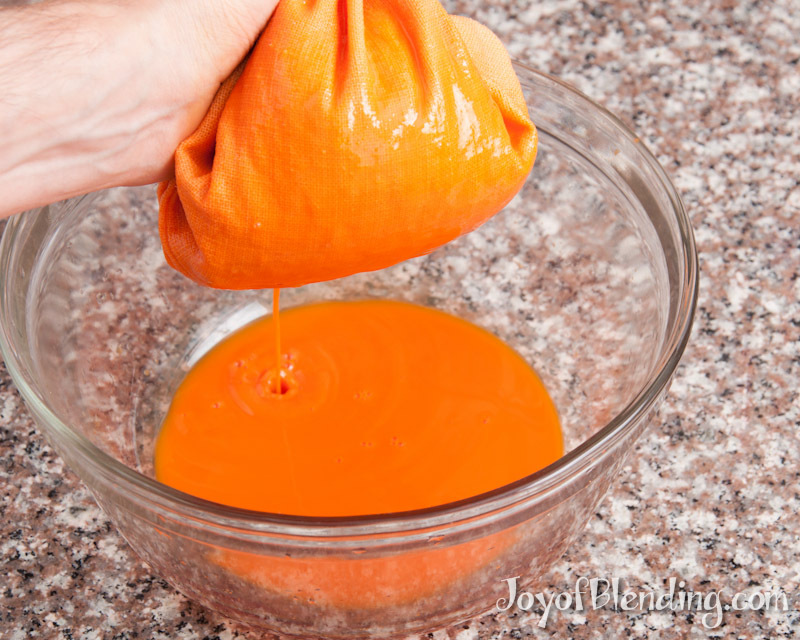 Put a filtration bag into a medium-size bowl and scrape carrot purée into filtration bag. A long narrow spatula is helpful here. Gently squeeze the bag and the juice will flow out. Once the flow slows, you can shift the pulp around inside the bag and squeeze some more. I was surprised with how quickly and easily the juice flowed out of the bag. I would say most of the juice was out in about a minute, and then it turned to diminishing returns. I poured from the bowl into a wide measuring cup to make it easier to pour into glasses. I was also curious about the yield. I looked up how much juice to expect from a pound of carrots; Wikipedia says 8 oz, consistent with most other sources, while one source says 6–8 oz. My pound of carrots yielded ~11 oz!1 What the heck?! The Vitamix out-juiced the juicers! Was this a particularly juicy batch of carrots? Possibly, but I suspect that by squeezing the filtration bag you can get out more juice than a typical juicer can. The consistency and flavor were perfect: no detectable fiber, perfectly juicy, and pleasantly sweet. 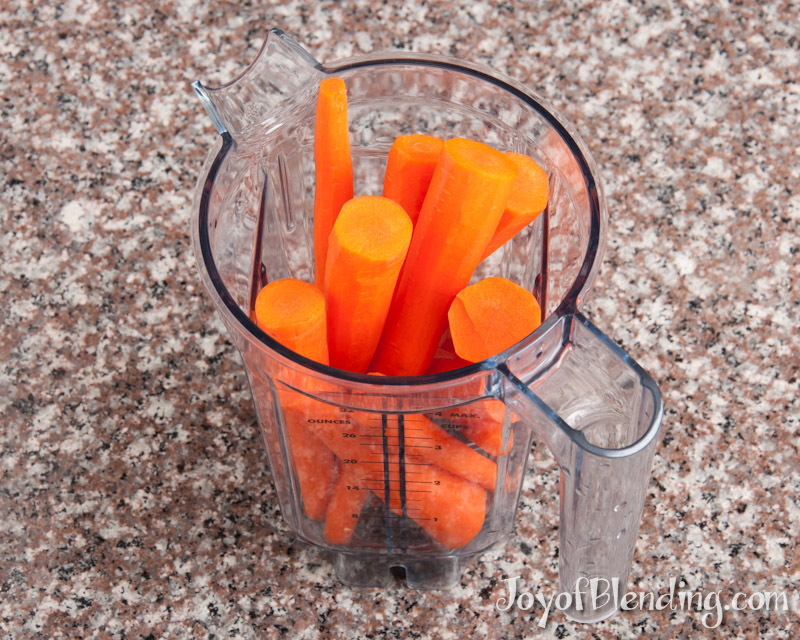 The Vitamix does warm the carrots a bit during blending. The first time I didn’t pay attention to temperature until right after blending, when the maximum temperature was 88 °F (ambient temperature was ~75 °F). I have no idea if that temperature is enough to affect the carrots. However, as a test, the second time I started with chilled carrots. After washing and peeling them I let them sit in a bowl of ice water for 15 minutes, and I made sure to not blend for longer than necessary. That time the maximum temperature of the blend was 65 °F. We enjoyed the juice straight, but on a hot day I could see serving it over ice cubes. The filtration bag is quite easy to clean—I just flipped it inside out, scraped off the carrot pulp, rinsed, scrubbed by hand with some dish soap, and then rinsed with more water. 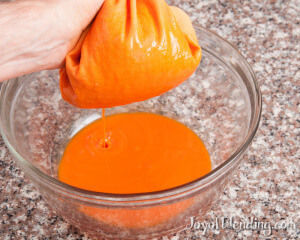 The carrot juice will dye the bag (maybe not if you use a nylon bag?). The Vitamix instructions that come with the bag suggest that you can remove stains by soaking in dilute hydrogen peroxide for 5 minutes. I tried it out of curiosity—it worked a little, but most of the color remained. Ultimately I don’t see anything wrong with having an orange bag. I’m not sure if I’ll make anything with the leftover pulp. I’ll post an update if I do. Making this Vitamix carrot juice was much easier than I thought it would be. It seems like it may well be less work than using a juicer that has many parts that you have to wash and dry. A juicer would probably have the upper hand for making extremely large quantities of juice, but, for things like this, the Vitamix works great. In terms of blending vs. juicing, I obviously usually come down on the side of blending. I generally think that the fiber is worth keeping, from a nutrition, economic, and convenience standpoint. But for when you want a traditional juice, the Vitamix can still deliver. This was an eye-opener! who knew? The comparative measure was interesting too, though I bet you had a particularly juicy bunch of carrots. And it would be worth experimenting with adding ginger, for those who love the ginger-carrot combo. I’ve been juicing with my Vitamix all summer. I start with about 1/4 cup water in the jar. I usually add carrots, apple, celery, lime and some greens. My VM nut milk bag is terribly stained. I bought a bag at Whole Foods I like much better. The juice strains faster and the bag is easier to clean. I love my daily juices, and I love how easy it is to make them with my Vitamix. Awesome! Do you remember the brand of the bag you prefer? I just bought another one. The company name is Kitchen Supply out of Illinois. Thanks! I’ll keep an eye out for one of those. I took a look at that recipe, and it seems like the squeezed out pulp would not be good for it. The squeezed pulp does not have much flavor left because most of the flavor (and sweetness) leaves with the juice. Have you made halwa with juiced carrot pulp? I guess it might work if you added extra sugar? 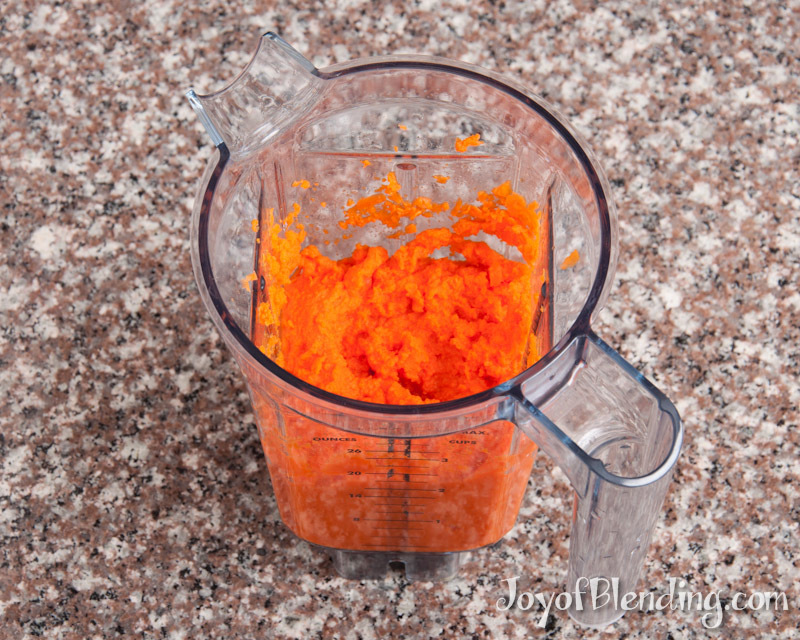 You could also use a Vitamix to quickly and easily shred carrots for the traditional Gajar Ka Halwa recipe. Actually the squeezed out pulp without much natural juice is arguably better for this recipe. It allows the carrot to soak up the warm milk. Interesting! Thanks for clarifying. Would you mind sharing your recipe? I have an Omega juicer but was having trouble with it today so I searched and found your post. Thanks, very helpful. Just finished sipping the juice, delish, will be doing this again! Oh, another use for the pulp–I’ve made this before, very nice! I own a blendec, who I thought I was emailing. Do you have information on the beets being juiced in a blendec? My blendec is a refurbished Es3. 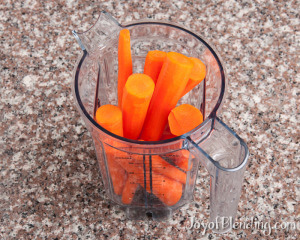 I love it and really want to blend carrots, beets apples, etc. This is an area where the Vitamix tamper really comes in handy. You can try this same technique with your Blendtec, but I haven’t tried it with a Blendtec yet. I would recommend chopping the ingredients into small pieces to increase your chances of them blending up well. 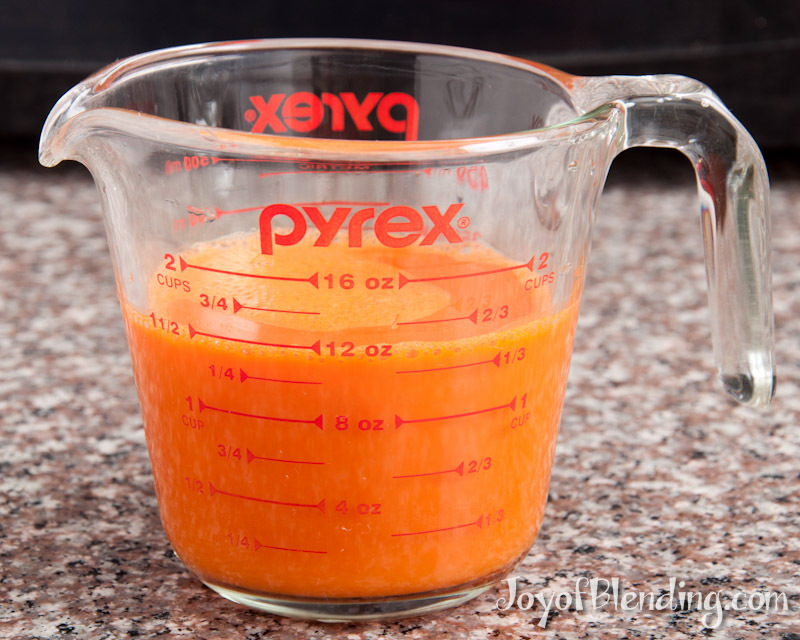 I want to make carrot juice, what do you do with the pulp, seems like a lot left over, should be some way to use it…..
Just wondering if anyone has come up with a use for it….. I just compost it. Some people make crackers from it by dehydrating it. And I’ve also heard some people add it to baked goods. I was impressed by how there was no taste left in the pulp after squeezing it in the filtration bag. I don’t think there’s much left behind besides fiber. Sorry forgot to ask where do you purchase the FILTRATION BAGS ? 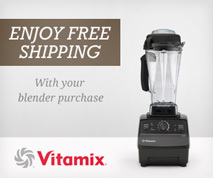 I use the Vitamix-branded one because they sent it to me. You can also find them for less on Amazon. I use left over pulp in my turkey meatloaf as a binder instead of bread crumbs. Works great! Thanks for the step by step instructions and tips.